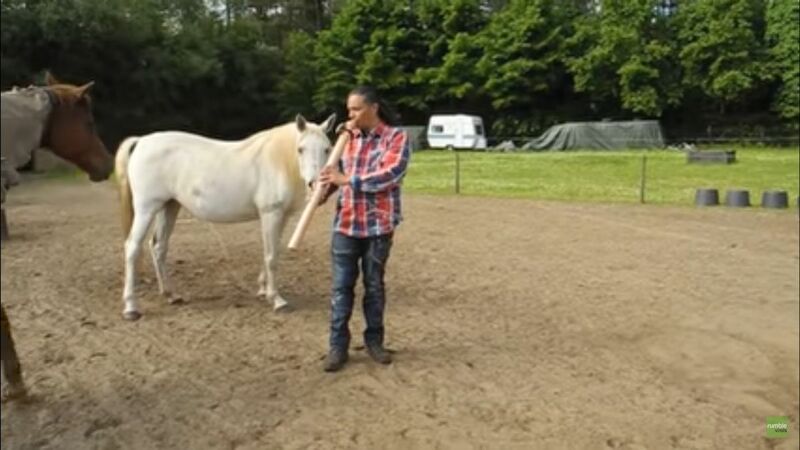 When this man brings a wooden flute into a horse pasture, you might imagine that any number of things would happen. But when he starts to play? The horses absolutely show that they enjoy and are fascinated by the music. They gather around him, inspect him intently, and seem quite happy to stand next to him as he plays. According to Equine Wellness Magazine, horses have quite sensitive hearing and can hear frequencies that humans can't. Music often seems to soothe horses, but the type of music being played may have different effects on horses. For instance, country and classical music are generally well-received by horses, while rock or rap may actually irritate horses. So what's the difference with these types of music? Horses often do well with songs which have short melodies and strong rhythms behind them. Music which is particularly high in pitch or which is played too loudly may bother horses because of their sensitive hearing. Horses are very rhythmic creatures - think of how your horse chews or walks in a rhythm - so playing a piece with a steady tempo and repetitive strains may naturally appeal to a horse. Many riders incorporate music into their work with horses. Racetrack grooms are known for whistling or humming songs to help soothe the horses they work with. Some barn owners leave a radio playing when the horses are in the barn to help calm them. Music can also be used to mask frightening noises during a ride, a vet exam, or a farrier visit. If you choose to play music for your horse, be sure to keep the volume down. Select music which is relaxing - remember, horses seem to prefer country and classical genres. While you play music, watch for signs that your horse is relaxing, or that the music may be irritating him. With a bit of experimentation, you can likely find a music setup which appeals to your horse.